Obtain the QUALITY in the different activities and development of the works and its products, offering the best CUSTOMER SATISFACTION possible through the implementation and maintenance of a Quality Management System in accordance with the UNE-EN ISO 9001: 2015 Standard. – SVE S.L. uses its Quality Management System as the main tool to implement this principle and improve the effectiveness of its organization. – SVE S.L. integrates Quality criteria from the planning to the development, execution, monitoring and review of all management processes; with the main objective of PREVENTING, REDUCING and/or ELIMINATING those elements that may negatively affect the quality of the products and services supplied to its clients. – SVE S.L. is committed to COMPLY not only with the REQUIREMENTS of its clients, but also with the legal, regulatory and other requirements subscribed by the management, applicable to its quality policies, constantly monitoring the adequate fulfillment of this requirements . – SVE SL encourages management system personnel PARTICIPATION and RESPONSIBILITY, and establishes actions aligned with increasing employees’ MOTIVATION, TRAINING, as a basic element for continuous learning, IMPLICATION and the correct COMMUNICATION among the different members of the organization. 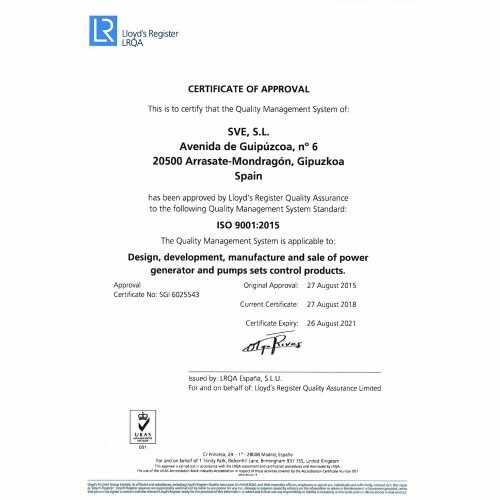 • Approved by the Management of S.V.E, S.L expressing its commitment to continuous improvement and Quality; as well as its commitment to provide the necessary resources (material and human) for the proper functioning of the system. • Reviewed periodically, at least one a year during the annual Revision held by the Management to continuously update the policies to the existing System and Organization. • Communicated to all employees, making sure it is understood and available to everyone within the company. • The reference framework for establishing and updating the improvement objectives defined by the organization, objectives that are constantly monitored to assess the effectiveness of the Quality management system.